1. Time is result of a natural process – one revolution of earth is one day, so on..etc. Man has just found a way to streamline his activities to maximize the utilization of day time. Mind build time sense by nature. My mind sets time for each activity & keeps on calculating lapsed time, remaining time, over time, in different angles based on critical nature of the task. Sense of urgency – increases my heart beat, makes me think faster than light, make me work faster than usual. World is like a race ground – all are running. One who completes faster gets appreciation, praise, monetary benefits. The one runs slow gets blame, scold, no monetary benefits. Race is by nature. You cannot stop it or take rest. You have to run or at least walk to beat someone who walks slower than you, otherwise it is not possible for you to survive. Life is counted as number of years, days, hours, minutes you lived. Unless you develop time sense in you, it is very difficult to cope up with expectations. 1. Increase your daily active life at least 10 – 15 mins by waking up earlier than the time you wake up daily. 2. Don’t be lenient on holidays. Wake up same time on Sunday too. 3. Follow a cyclic process – Set time goals, observe & take corrective actions for future. 4. Prioritize as much as possible. Force your prioritizing to broader level. Don’t just put all of them in 1,2,3 levels. Have unique level for each of them. If you have 20 activities in hand, have 20 priority levels. This gives unambiguous execution order. But do remember #3, and modify the priority levels based on current situations. 5. Have good mental health – everyday perform activity that gives you happiness at least for 10 minutes like talking to your parents, spouse, watching comedy videos, reading books that you felt close to your heart, washing your car, cleaning home, playing with your kids or pets. I cannot agree more with Stephen Covey after I read his book “First things first” especially when he explains about 2 x 2 matrix with classification under Important & Urgent tags. 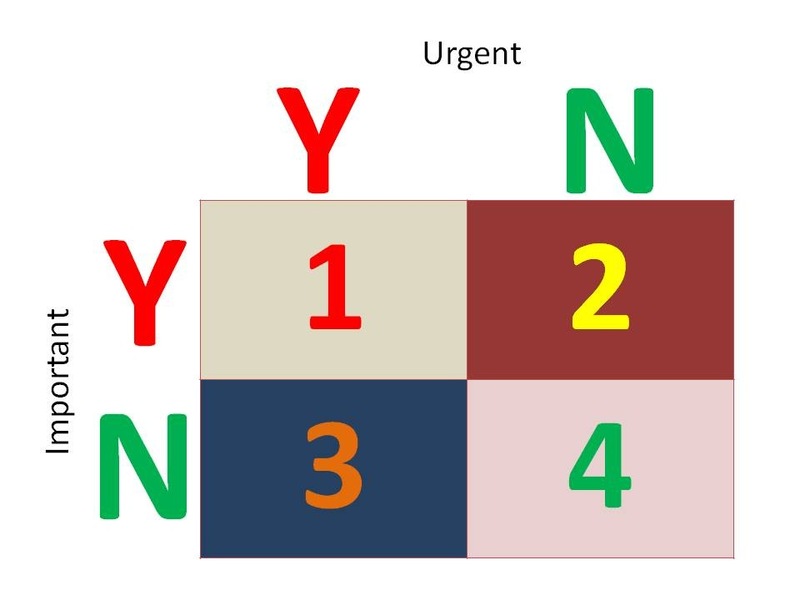 This is also called as urgency/importance matrix or time management matrix or time leadership matrix. In Importance angle, a task can be considered either Important or Not so Important. In Urgency perspective, it can be Urgent or Not So Urgent. Once a task added in our list, we start classifying it in these 2 perspective. It is not always true that one task will remain in the same quadrant throughout the life – priority changes and hence quadrant it holds changes. First quadrant holds tasks that are “Important & Urgent”, we will do it for sure immediately. Example: Customer issue, heart attack. 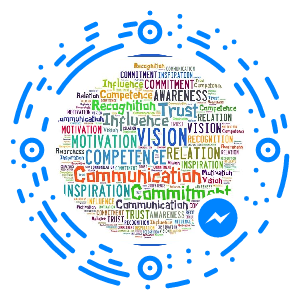 Fourth quadrants are time wasters tasks which are “Not so Urgent & Not so Important” ones like TV, movies, facebook. They are generally easier to do and have less stress associated with them. While enjoyable these tasks do not move you towards your goals. Main idea in this model is to work proactively on important things with some good breathing time i.e. in quadrant 2. Working in quadrant 1 is stressful, but it is not so in quadrant 2. We need to be careful in clearing of quadrant 2 tasks & in case they are not handled properly they can produce many quadrant 1 tasks that makes life more hectic. Use best judgment based on your experience & reduce time spent on quadrant 3 & 4 that gives enough time for us to concentrate on quadrant 2 activities. Best method to evaluate quadrant 3 activities are ROI. Ask “What return I get if I spent so much of time in this task?”. Trash those activities classified as quadrant 4 – never bring them back. What is Critical Chain Method in Project Scheduling? Creating realistic and accurate schedules is the first step towards project success. In Project Scheduling, PERT and Critical Path Method (CPM) are widely known methods. Using CPM, early Start and Finish dates and Late Start and Finish dates are calculated by forward & backward analysis of the project network diagram paths. But this method, does not take resource limitation into consideration. After identifying the path, resources are picked up & leveled. In general, activity owners add safety margin (buffers) to each of the activities in order to cope up with uncertainties. But this cause time waste when activities can be completed well before the estimated finish date. Critical Chain Method, developed by Dr. Eliyahu M. Goldratt (1997), is a schedule network analysis technique that takes account of task dependencies, limited resource availability & buffers. First step in this method is identifying set of activities that results in longest path to project completion which are called critical chains. As it includes resources into consideration, it may be longer than CPM schedule. Resources used in those critical chain activities are critical resources. Set of activities that are in non-critical chain but converging to critical chain are feeders. Next step is shortening the project schedule by reducing the activity duration estimates with effective buffer management. CCM focuses on eliminating project schedule delays due to uncertainties, overestimation of task duration and wasted internal buffers. In CPM, even a resource completes an activity before the planned finish date, the time gain is not propagated to next activity as he needs to wait till early start date of next activity. But delays are propagated which may even change the existing critical path. 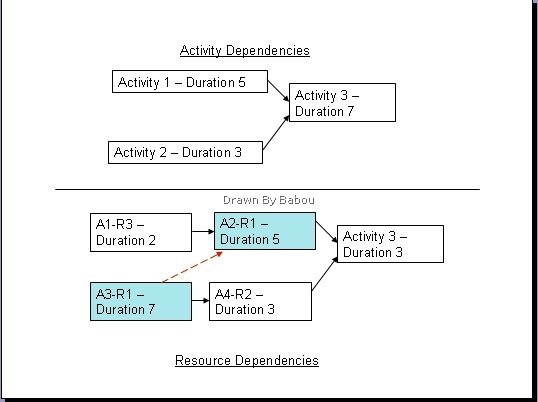 In the below example, I showed activity dependency & resource dependency across activities in a small project. Any delay in Activity 1 (upper part of fig), will delay the entire project. Also if you see, the critical path is Activity 1 – Activity 3, though activity 2 is completed long before, Activity 3 has to wait till activity 1 is completed. In the resource-leveled project(lower part of fig), same resource R1 used in two different activities A3 & A2. Though A1 is completed in 2 time units, but A2 has to wait till R1 finishes up A3 which 7 time units. Though A3-A4-Activity 3 is the critical path, but any delay in A3 or A2 will surely delay the entire project & due to Resource dependency another longest path comes into picture A3 – A2 – Activity 3 (15 time units). Hence, optimization of duration is required to concentrate not only on the activity dependencies but also on resource dependency. Another important factor one need to deal in project scheduling is – safety margins(buffers) to beat the uncertainty. Due to addition of buffers at different activity level, it is very difficult to calculate exact time of project execution & this safety margin will go waste due to Student Syndrome or Parkinson’s Law. In CCM, as calculation is based on set of activities in the critical chain, hence estimated finish dates for each activity is not of much use. Also, time gain or delay in an activity is fully passed throughout the chain activities. The internal buffers added to tasks are made explicit and summed up. The summed up value is called project buffer. As per CCPM, project buffer is part of project, hence project duration remain unchanged even after stripping off all the activity safety margins. And keeping them improves protection against uncertainties. Also, 50% probability time estimates are used in calculating the activity durations in CCM instead of traditional 95% probability. Difference between original schedule estimates and new schedule estimates gives the project buffer. In general project scenario, there is 100% chance that activity-wise safety margin get exhausted by poor buffer management. In CCM, pooled project buffer is used as safeguard the entire project & even it is utilized up to 50% allows project completion well within the schedule. CCM introduces 3 different buffers. 1. Resource buffer, 2. Feeding buffer, 3. Project buffer. Out of these, I discussed about project buffer previously. Let me give gist of other two buffers next. Resource buffer is inserted just before critical chain activity where ever a critical resource required. This is used to give a signal to the critical resource that a critical chain activity to which they are assigned is due to start shortly. According to CCPM, this wake-up call will cause the critical resource to wrap up any non-critical work and be ready to start work on the critical chain task as soon as its predecessors are completed. The resource buffer does not actually consume any resource, and it adds neither time nor cost to the project. 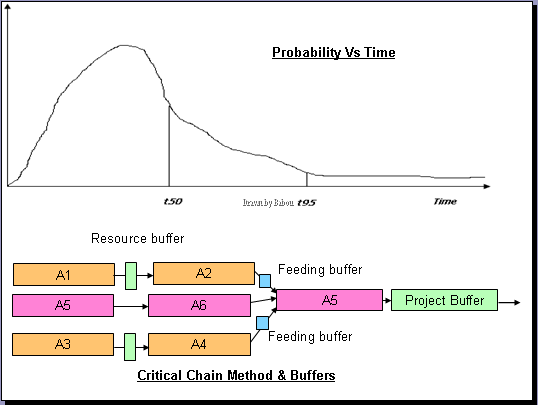 Same like project buffer, pooling of activity safety margins in a non-critical chain & applying them at the end of those chain.Because this buffer is placed where the path feeds back into the critical chain path, it is called a feeding buffer. See the placement of feeding buffer in the fig. 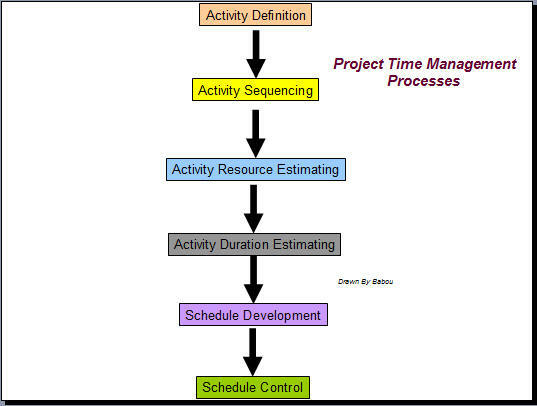 Project Time Management consists of 6 major processes. 5 of them are under Planning Process Group & 1 process comes under Monitoring & Control Process Group. One can notice high interdependency between time management processes. It is not required that all these processes to be defined separately. In some cases like a project with smaller scope may have all time management processes combined in a single process. Development of schedule involves analyzing numerous options and applying different techniques to meet the project (imposed) delivery date. Various schedule network analysis techniques are used to generate project schedule. Some of them are Critical path method, critical chain method, what-if analysis and resource leveling. More than one technique can be applied on project schedule to come up with expected schedule. * What quantity for each resource will be required. * A bar chart showing the amount of time assigned to a resource for the time interval. * Resource availability is depicted as a line for comparison purposes. * Resources assigned more work than available hours are considered ‘over-allocated’. If supply is sufficient to meet the demand, then projects does not have any resource allocation issues. But this may not be the case in real time scenario – Demand will exceed supply & resource scarcity arises. Project manager uses a technique called ‘Resource leveling’. Resource Leveling is a project management technique used to examine a project for an unbalanced use of resources (usually people) over time, and smoothen distribution of resource usage by resolving over-allocations or conflicts. With this technique PM ensures resource demand does not exceed resource availability. Resource leveling is applied to a schedule model that has that has a critical path identified. In critical path method calculation, preliminary early start & late start schedule is calculated which may need more resources in different time line. After resource leveling schedule, projected start and finish dates(which may be longer than the preliminary dates) are calculated to reflect resource availability and even there could be a change in critical path. 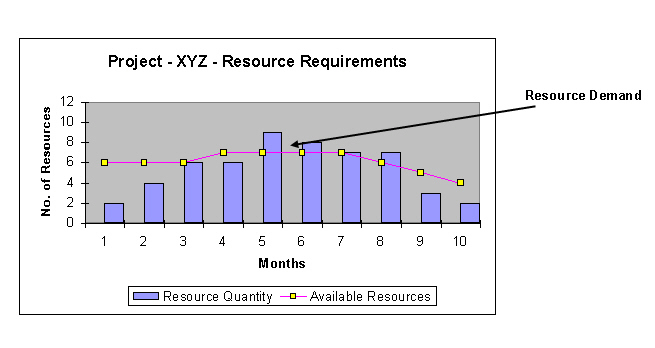 There are issues with using the simple bar chart for resource leveling as the interdependency between activities is not available in them, which may result incorrect schedule plan. * Time-constrained approach – In this case importance will be given on completing the project within a specified (imposed) date. This date will usually have been determined by network analysis. Changes in the duration of any activity, and the resources required at a given time, must be undertaken within the float (slack) available. Obviously there can be no adjustment of activities which are on the critical path. * Resource-constrained approach – In this approach, the project must be completed with limited available resources even if this means extending the project duration. If the total resource demand exceeds the resource availability at any time then some of the activities must be delayed until there is sufficient resource availability. For both of the above approaches, information regarding the earliest & the latest start times and slack will be used to level resources. * Allocating scarce resources to critical path activities first can be used to develop a project schedule that reflects such constraints. * Common way to bring the project back on track is resource reallocation from non-critical to critical activities. This may at least bring schedule as close as possible to its originally intended overall duration. * Resources working extra hours , weekends, or multiple shifts by authorizing overtime to reduce the durations of critical activities. * Adding or substituting resources of equal or greater productivity to shorten durations that have extended the preliminary project schedule. Other than impact in duration, some of the above options have impact on project cost & risk also. As a manager, you are developing schedule for your project. How do you specify time estimates for project activities? From analysis,usually, single-point, most-likely estimates are used for activity duration estimating. But these estimates does not represent accurate information and it may lead to schedule overrun situation. Project manager’s ultimate goal is to create a realistic project schedule that provides a basis for monitoring project progress for the time dimension of the project. Adapting better estimating technique is needed for project success. Three-point estimating is one of the general estimating methods that helps project managers produce better estimates. Instead of providing discrete activity duration estimates like 3-weeks, 2-days, etc., the accuracy of it can be improved by considering the amount of risk in the original estimate. * Most likely(approx. realistic scenario): The duration of the schedule activity, given the resources likely to be assigned, their productivity, realistic expectations of availability for the schedule activity, dependencies on other participants, and interruptions. * Optimistic(best-case scenario): The activity duration is based on a best-case scenario of what is described in the most likely estimate. * Pessimistic(worst-case scenario): The activity duration is based on a worst-case scenario of what is described in the most likely estimate. An activity duration estimate can be constructed by using an average of the three estimated durations. Three-point estimates are needed for PERT estimates and Monte Carlo simulations.